Team Stimey always celebrates Martin Luther King, Jr. Day. Ever since 2009 when Jack fell madly in love with Martin after learning about him in school, we've religiously observed the day by watching the iconic I Have a Dream speech and eating birthday cake. Sometimes there is other civil rights education that goes on as well. It all kind of depends. The cake and speech are non-negotiable, however. We all know, of course, that MLK Day is supposed to be a National Day of Service as well. 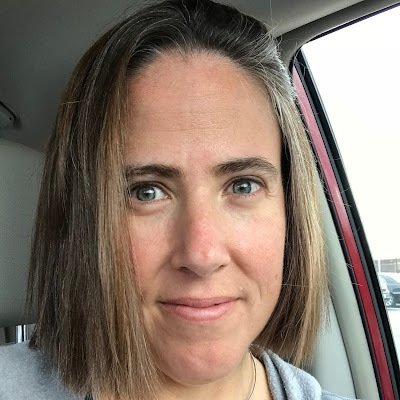 Alex has taken the kiddos on walks to clean up trash now and again on the day, but we've never participated in an organized service project. 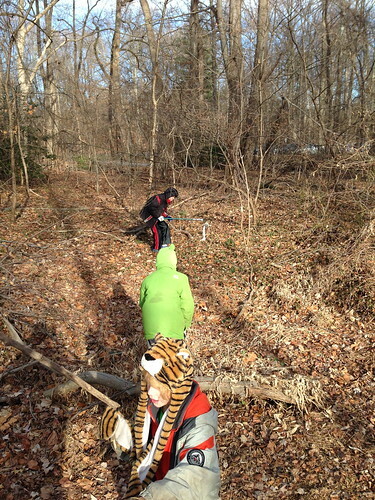 We joined Hiking Along in their quest to clean up Sligo Creek, a creek that runs through my area. 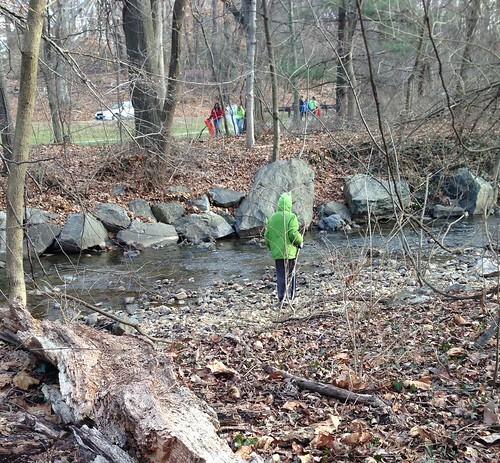 Somehow telling my kids to "put on shoes because we're going to go pick up trash by Sligo Creek!" actually resulted in all three of my kids putting on shoes and happily piling into our car, which was EXACTLY the opposite of what I expected would happen. Huh. Who would have guessed? We arrived on site to find a sign suggesting that each of us "Be a watershed hero!" We also arrived to find one of Sam's buddies from school there with his family, which was great because that was like instant buy-in for Sam. We set about collecting plastic bags and gloves (oh thank the good lord they were not latex gloves) and then I looked up to find that Jack had made a new friend. Jack! We are supposed to be collecting TRASH, not DOGS. Honestly, I can't take my eyes off of him for a second. We set off along the creek to pick up some trash although some of us (Quinn) didn't bother to get gloves because some of us (Quinn) seemed to know ahead of time that some of us (Quinn) were completely uninterested in picking up trash. Sam was earning student service hours for the event, so it was most important that he be involved. Meaning he had to pick up the grossest garbage. Other members of our party got to focus on other things. Like running. And spinning. 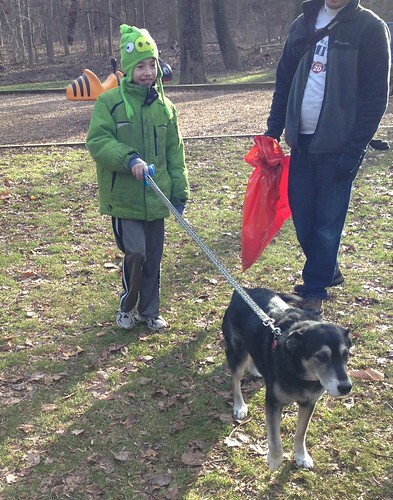 Although to be fair, Jack did take spinning breaks to pick up the occasional piece of trash. At first Sam was all, "What the—?" But then he realized that if he did most of the trash picking up, he got to have solo control of the little grabby thing we’d brought with us. Although, honestly, he kinda was. 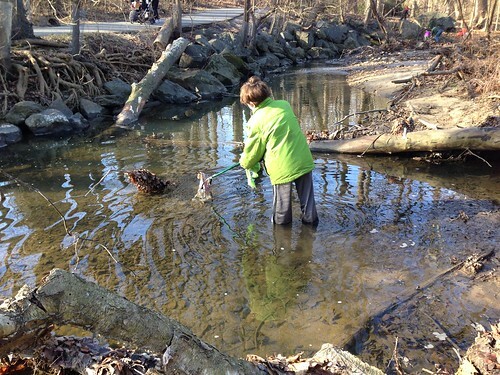 Still, it was Quinn who was the first to actually go wading in the creek. Normally, I tend to expect this. My kids seem to be physically incapable of standing near water without walking in it. This would be no big deal, but for the fact that it was 40 degrees this morning. I didn’t get the photo of him actually IN the water because I was too busy shouting at him to get out. 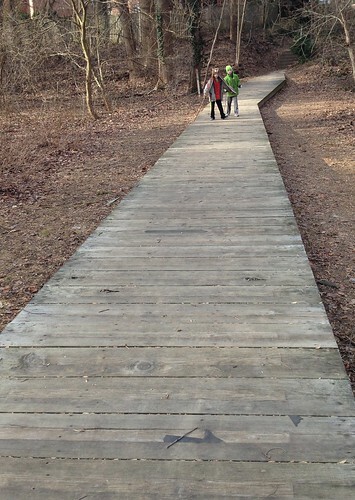 Whilst those shenanigans were going on, Sam and I continued on our treasure hunt for garbage creekside. I only lost him when he had the gall to try to do some learning on our service outing. We actually had a really nice time. We had an hour and a half time block, so there was plenty of time to wander around and collect a pretty impressive amount of trash. We saw some deer and also watched some ducks, which were an excellent example of Creatures in the Watershed That We Were Currently Helping. 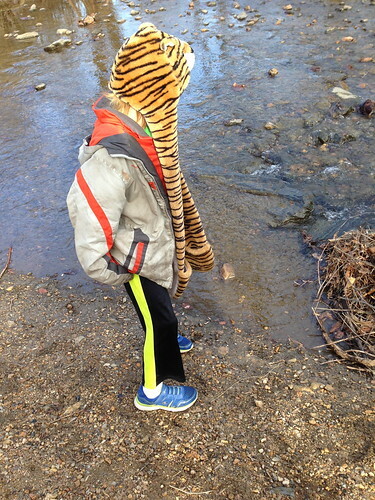 Even though the temperature was low, unless you were wading in the creek, the air was actually quite comfortable. We even got a little ambitious and climbed over thorny bushes and navigated precarious sandy shores to get to some of the more challenging trash. 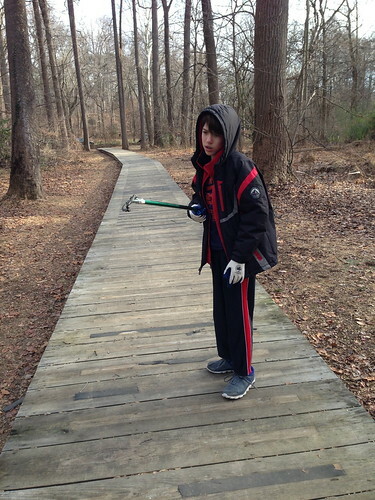 Jack proved himself to be a real Hero of the Watershed by collecting the most challenging piece of trash on our whole route. And I proved myself to be, at best, a Questionable Parent. The only reason I asked him to do this was because he already had wet shoes and pants from his voluntary foray into the creek moments earlier. Then we returned to our start point, where they had hot chocolate for the volunteers. We might just have to add this to our MLK Day routine. It was fun, we did a good thing, everyone got a lot of fresh air, no one lost a toe to frostbite, and we all really earned our birthday cake. Great! I am looking forward to the day when my kids are old enough to do things like this. Thank you very much for coming yesterday with your kids! I am so glad you had fun. Most kids, even mine, groan when a parent says "let's go for a hike" or "come with me to do a stream clean up" but they never realize until they are in the moment how much FUN it is. Kids live in the moment anyways - its in their nature (sometimes adults need to do that too!). 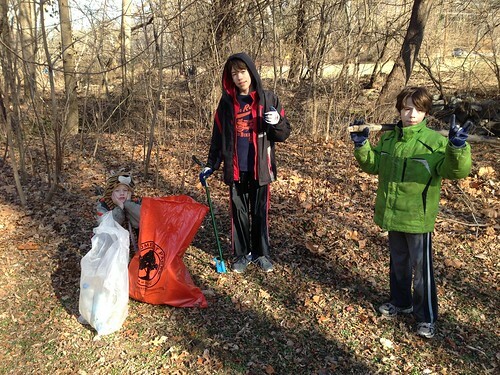 Thank you for sharing your wit about participating in a stream clean-up with your kids. 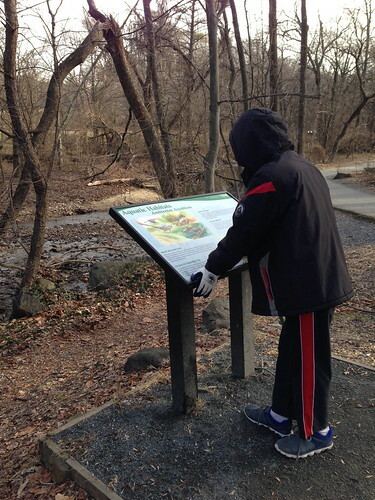 I love reading parent's points-of-view when they engage with their kids outside. this is a million kinds of awesome. Hello this is Keegan again from the Sluis Academy and i must say that was a great post! Sometimes its crazy things that kids find interesting and this definitely falls under that category!! haha although maybe its just being outdoors is why they enjoy picking up the garbage! Hopefully the excitement will remain because that is a habit that even helps to improve the environment!